(Newser) – A time capsule buried during the construction of a Nazi training center in Poland has been unearthed—82 years after it was buried, and 71 years after Adolf Hitler's "Thousand-Year Reich" was eradicated. 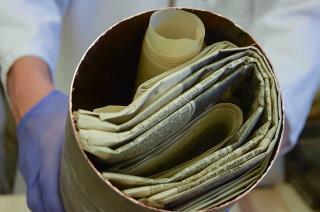 The copper cylinder recovered from the foundation of the Ordensburg Krossinsee building in Zlocieniec contains exactly what you would expect Nazis to put in a time capsule: Researchers found two copies of Mein Kampf and photos of Hitler, along with coins and newspapers, the Independent reports. High-ranking Nazi officials deposited the capsule when construction on the center for training future Nazi leaders began in 1934, History.com reports. Not too many respondents biting on this story. It must be hitting too close to for a good many of you out there in cyber world, next to Disney World. Would love to see the old film. One mistake people made in storing film was not developing it, and letting us develop it in our time period. The problem is that we may not even have those chemicals and if we do, we don't know the formulas. There was such as case where a guy built a complicated machine to develop one frame of leader using different formulas until he finally hit on the right one. Did it mention Hitler's grandchild, Donald?